Denver's airport has partnered with TSA to unveil a new technology system meant to make screening quicker and more relaxed. Raising your arms above your heads may eventually be a thing of the past for passengers headed through Denver International Airport security. That's because DIA is the first U.S. airport to provide "next-generation" Enhanced Advanced Imaging Technology (eAIT). 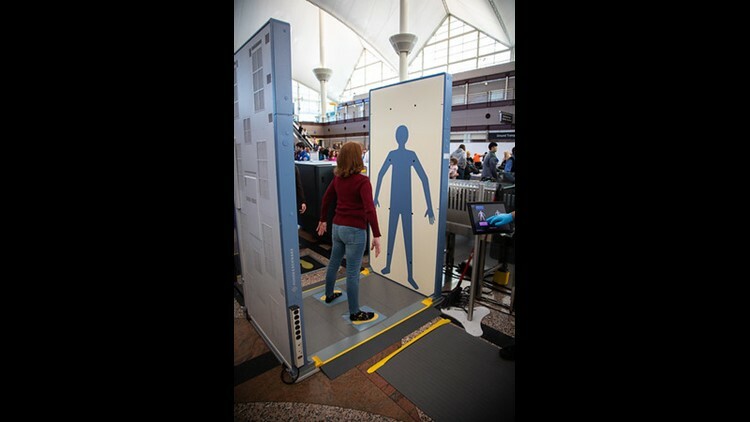 DIA on Monday unveiled the new technology, and will be testing one machine in the north security checkpoint. The test phase will go on for three months, at which point DIA officials will decide if they want to install more, according to a DIA spokesperson. The long and short of the new tech is that passengers can stay relaxed(ish) -- instead of holding their arms above their heads, for example, they can keep them down at their sides. Scanning takes less than a second. TSA is testing the new eAIT security device at DIA. "Much like the new automated screening lanes installed this fall, we will test this new screening equipment in hopes of a wider implementation once the new screening area on Level 6 is constructed," said DIA CEO Kim Day. DIA is undergoing a $2 billion renovation project that includes a new Great Hall area with retail and restaurants, as well as the moving of security from Level 5 to Level 6. The Transportation Security Administration's (TSA) new eAIT machines include updated detection capabilities and the potential to speed checkpoint screening operations and increase throughput, DIA said in a news release. “TSA is committed to evaluating and deploying the best cutting-edge technologies to keep passengers secure and improve the screening experience,” said TSA Administrator David Pekoske. Two additional screening stations will also be set up nearby the main security lines to allow for extra screening, when necessary. If the current eAIT machine is successful after the test phase, DIA will install more machines once security fully moves to Level 6 by the end of 2021.